I figured out a simple and effective way to keep the G-Hook ends of the compression straps on my Highlander from backing out of position. I used 9" lengths of shock cord, which I then threaded through the upper part of the G-Hook and tied off with a double overhand. This seems to be about the right length of cord to allow me to wrap overtop of the G-Hook after its been passed through the web tab. 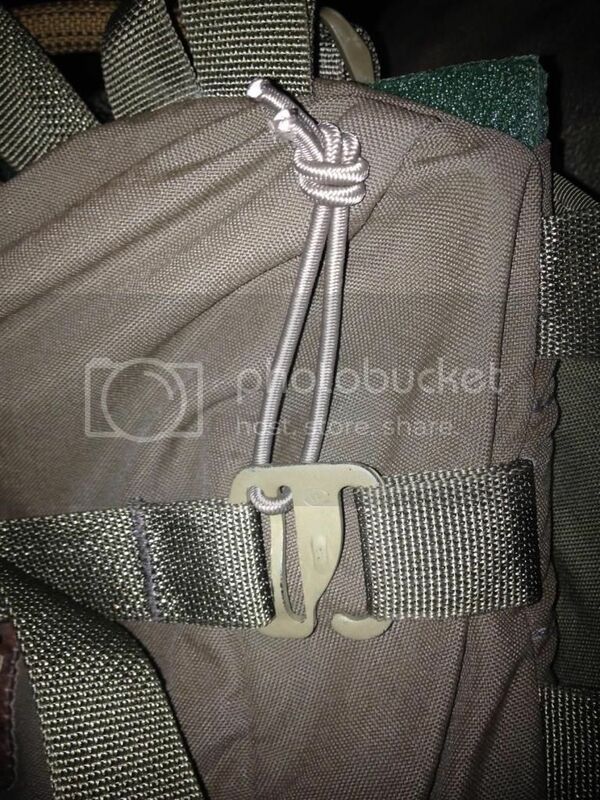 If the compression strap is unbuckled for whatever reason and hanging free, or if the pack is nearly empty with the straps not fully compressed, this keeps the G-Hooks from backing out and potentially losing a strap. These also perform dual-duty as web keepers for excess. I reckon this same method could be used on just about any G-Hook strap to keep them from coming loose. I like this modification a lot! I like this as well. Like the g-hooks alot but don't like the lack of retention when hanging loose. Nobody is super happy with G-hooks as implemented, but they are still the only thing that function in that particular way. First Spear was actually the outfit that came up with the "wave" feature which helped part of the functionality out. The other problem with them, this particular mod helps with. I drew up a different version myself that should fix both problems but haven't gone any further with sending the design to our metal stamping guys. One thing I'll add with this mod is to ensure you adjust the knot in the shock cord to where you feel it's going to remain tight enough to stay attached to the G-Hook. Really pull on the tails of the shock cord and seat the knot, so that it doesn't "walk" looser than you originally tied it. 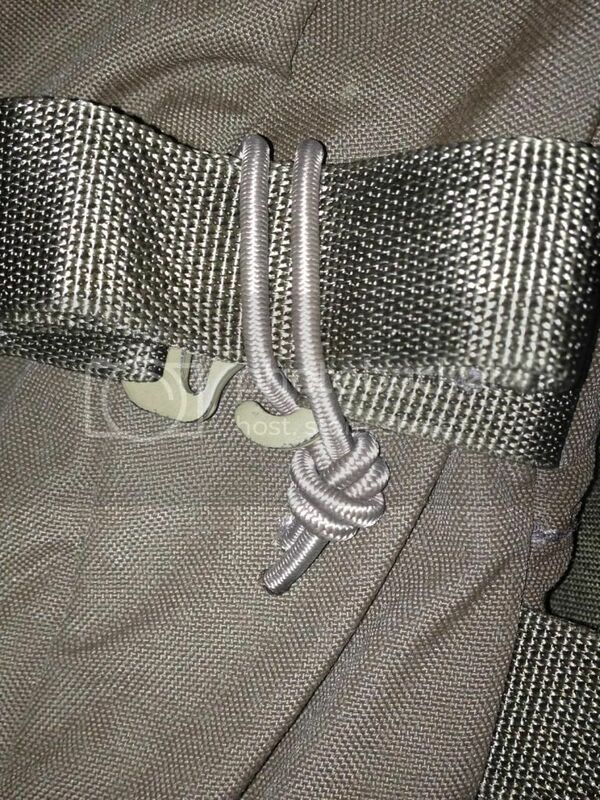 Because shock cord stretches, unless you seat the knot well, they can loosen. I put tight knots in, and pulled the tails hard to avoid any walking. So far, the ones I've added to different G-Hook straps on a couple different HPG packs have been doing great for keeping things right where I want them. It took me second to see how it was looped, but now that I see it, it looks like a really simple solution. It reminds me of the webbing dominator buckles that hold excess webbing on compression straps. If I want knots to stay and don't care if I can undo them (without a knife) I put some adhesive (silicon, superglue, E6000) on them and let it set. The knots will not come undone! It might help in this application. 4mm shock cord is what I use....which is a little bigger than 1/8", I believe. For reference, the shock cord that is used for the water bottle retainer system on HPG shoulder straps will fit, as will the shock cord that comes attached to an ITW Web Dominator. I've also found the elastic webbing keepers, that come standard on HPG packs, work pretty well for g-hook retention. Smart fix. Thanks. Heading to REI to get some bungy cord after work today. I did this on a tara + pocket harness, so the procedure was slightly different -- at least MY procedure was slight different! Har har. So far I've been quite pleased. If memory serves, the shockcord I have on hand is 3/16, which is just a tad - as in just under a mm - wider than 4mm. And I could tell, getting it in there. For anyone who hasn't yet done this that plans to do so, I would say that 3/16" is probably the max desirable, and if I were in a store staring at options I would probably second Ken's selection. That being said, for the Tara, that extra combined diameter of ~1.5mm does a really nice job. Without cutting and sewing, I don't have the tails that Ken appears to utilize in his approach. Instead, I tied my shock cord "behind" the metal (top) and plastic (bottom side) clips (not sure the correct term) on the loops onto which I fasten my G hooks to attach the pocket harness onto the Tara. Ofc when flopping around while not in use it can flop around to "in front" in the case of the bottom-side plastic clips. If it becomes an issue, I'll switch to metal clips on the bottom too.. Ah....I see how you went with yours. Slightly different technique, but appears just as effective. I noticed that the webbing on yours was through the "first" slot on the g hook instead of the "second" and since it's undocked and I've removed the tie-down webbing that loops around the back, I don't have the tails you used, either. I should have made it clear that I had removed additional webbings. My plan is to use the shock cord in lieu of the webbing around the back for cinching / stuffing a rain jacket. I find that not having to deal with two layers of webbing around the back improves my daily use in terms of minimalist undocked role and docked addon role. Unfortunately the cord locks that I have on hand are for 1/8 or 1/4 so I gotta order a large size when I get around to it. No big deal just gotta get to it. I too found a fix, I slid a ranger band over the whole strap, connected it, then pulled the band back over the g-hook. Seems to work well so far!